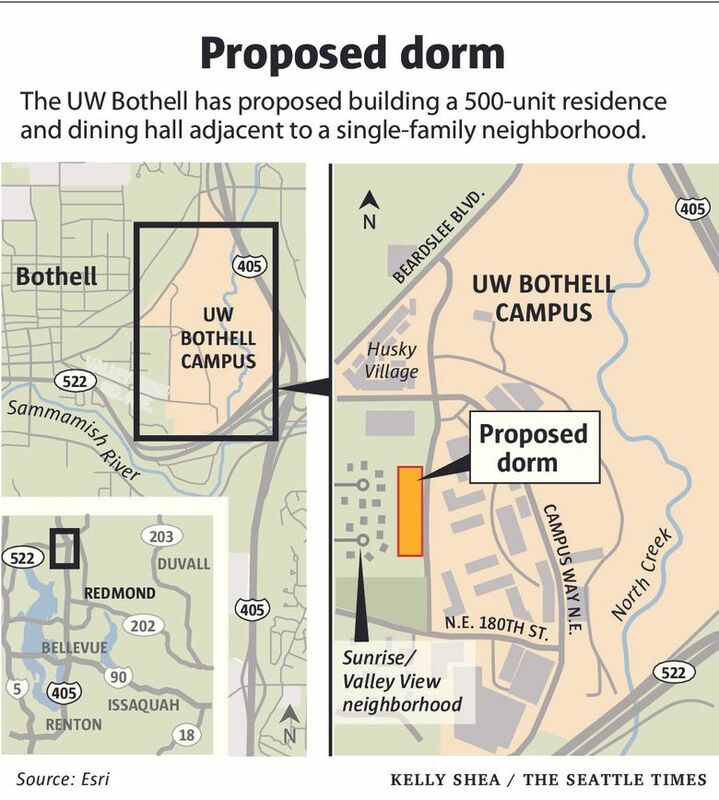 People who live near the UW Bothell campus are upset about a proposal to build a dorm for 500 students 60 feet from their backyards. They worry about noise, lights and the inevitable bad behavior of young adults away from home for the first time. As it has grown and added four-year degrees, school officials say, the demand for student housing has grown, too. The university several years ago bought a nearby apartment complex and leased another, but together they total 270 beds for a campus of more than 5,000 students. The dining choices are also limited to a Subway and two tiny coffee shops. But a UW plan to add a four-story, 500-resident dormitory and dining hall at the top of the hill, 60 feet from an adjacent single-family neighborhood, alarms nearby residents who worry about noise, lights, garbage and delivery trucks, and the inevitable bad behavior of young adults away from home for the first time. “We aren’t anti-students. We want them to have as much fun as we did as students. If the dorms were located in the middle of campus, they could have fun without disturbing anyone,” said Parvin Pemberton, whose house in the Sunrise/Valley View neighborhood would look directly into the new dorm. The neighbors also criticize the university for not involving them sooner. Some say they only learned about the dorm proposal in January, when the UW Board of Regents approved $3.2 million to begin the design and permitting process. They point to a flier distributed by UW Bothell in December inviting neighbors to an open house on a “Campus PUD,” an abbreviated reference to what, in zoning-speak, is a Planned Unit Development. No mention of a plan to build a 125,000-square-foot residence hall. “We were completely blindsided by this,” said Steve Pemberton, Parvin’s husband, who, with other neighbors, is asking UW Bothell administrators to consider alternate sites. Vice Chancellor Ana Karaman said the university has studied seven other sites, but all lack the footprint needed for a similarly sized dorm. A 2014 student survey showed that more than 1,000 students would live on campus if space were available. The university hasn’t applied yet for building permits. Rather, together with Cascadia College, which is also at the site, they’ve asked the city of Bothell to retire the current land-use designation — a Planned Unit Development — which sets out the rules and conditions for campus construction. The university wants to replace the PUD with a Campus District designation, which would retain existing requirements such as building height and setbacks, but allow for faster permitting. The change also would make city staff responsible for final approval instead of a hearing examiner. Karaman said there are good reasons for seeking the change. When UW Bothell built its most recent building, the $68 million Discovery Hall, which opened in 2014, it cost about $250,000 just to get the necessary city approvals, she said. “It takes public funds, student tuition, just to modify the PUD. That’s money that could be invested into students,” she said. Since learning of the neighbors’ concerns, she said, the university has reached out to present its plans and to form a landscape committee that would help design a 30-foot evergreen buffer between the dorms and the adjacent houses to screen noise and views. She said the college also has revised its conceptual design for the residence hall, reducing the height from six stories to four and breaking up the building into four wings set at angles to minimize the number of windows that will look directly into the neighbors’ homes. UW Bothell has also asked the Board of Regents to postpone a March agenda item to approve the site and construction budget. “We want there to be time for dialogue with the neighbors. Our goal is to reconcile with them completely,” Karaman said. The Bothell City Council has held two public meetings on the university’s request to retire the PUD. Community Development Director Tom Burdett said that as the university has transitioned from a commuter school to a four-year college, it has added academic buildings, sports fields and a student center. He agreed that current regulations governing campus development are cumbersome and costly, both for the city and the university. Under the College District designation, he said, neighbors would still get notice of land-use applications. And staff approval of any new development could still be appealed to a hearing examiner. Burdett said he thinks the university is looking for a process that moves a bit faster and costs less. “They’re not trying to circumvent any kind of public engagement or involvement,” he said. A third public hearing is March 1. 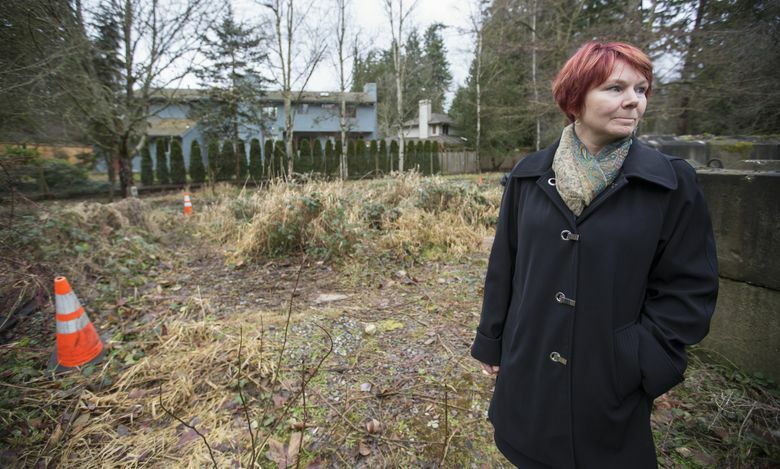 Bothell Mayor Andy Rheaume, who toured the campus’ western edge and the adjacent properties last month with UW officials and about a dozen neighbors, said he shares residents’ concerns about the impacts of a dorm 60 feet from their backyards. Rheaume said he’d like to see the university keep the current rules in place for the dorm project, then move to a more streamlined process. “One of the main reasons the PUD is in place is to protect the character of the existing neighborhoods,” he said. Another Sunrise neighbor, Jannelle Loewen, has already stapled protest signs to sticks and said the neighborhood is ready to demonstrate its opposition if the university doesn’t step up its outreach and find an alternate dorm site. Her fear is that the university won’t stop at one dorm but will add more close to the existing houses as the campus continues to grow. “Put the dorms somewhere else. Certainly not next to any single-family neighborhoods,” she said.